Ronald Poulton was one of the foremost figures in English rugby at the turn of the 20th century. A centre of great ability and possessor of a beguiling swerve, Poulton won 17 caps for England and scored eight tries before he was killed by a sniper's bullet during fighting at Ploegsteert Wood on May 5, 1915. Poulton was the heir to the Huntley and Palmer biscuit business in Reading, and alongside his rugby achievements also studied at Oxford University, scoring five tries in the 1909 Varsity match against Cambridge. He also found time to turn out for both Harlequins and the Barbarians during his short career. 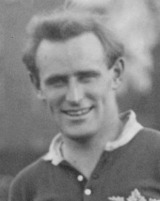 Poulton (who added Palmer to his name in 1914 after becoming heir to the biscuit fortune) eventually captained England during their 1913-14 Grand Slam season, scoring four tries against France at Stade Colombes - a Championship feat that was not matched until England winger Chris Ashton bagged four tries against Italy in 2011. Despite his commitments in England, Poulton volunteered immediately for service with the Royal Berkshire regiment in 1914, arriving on the Western Front in 1915.